A group of 6 women shared the 4 bedroom suite on the top floor. It had lots of space and the beds were oh so comfy, which meant a lot after a busy day exploring Barcelona. Location is perfect - a block from Sagrada Familia and the metro and multiple restaurants which have excellent food with reasonable prices. We highly recommend it. We were an extended family of 6 renting a 3 bedroom, 2 full bathroom apartment with Sagrada Familia views and it was really great for us. It is modern and very spacious apartment with almost everything you need in a nice residential street a block from Sagrada Familia (and 2 metro stops) and direct view of the Catedral. Staff at Reception was friendly and helpful (can leave luggage there during their work hours (9-5 I believe). The building is well isolated from noise and each room has independent AC and blackout curtains. WiFi was great too. Plenty of restaurants around as well as grocery stores and pharmacy. Our apartment also had a hidden "wall" bunk bed in dining area so in practice 8 people could sleep in real beds if needed. The check in staff was great. The balcony and roof top were nice to have. The location was also great. Only issue was a loud group that was on the rooftop well into the night that woke up our children. Overall, this place is comfort and the manager is helpful and nice. The Location so far is convenience. The views were incredible ! And the staff was the absolute best. By far the best hotel in Barcelona. we managed to check in at least 2 hours earlier than the recommeneded time. Check in Assistant was very pleasant. Bonus that she told us there was a rooftop garden with loungers and views of the city. Most bedrooms and living area had vies of the sagra Familia. few mins walk from the Sagrada and the Sagrada Metro station also. Local bakery accross the street and super market 2 mins walk away. Well located property. Within easy reach of metro, food and some shopping. spacious apartment. with 2 toilets. It was an old property but had a lift, which was very useful as we stayed on a higher floor. Helpful staff. Host was great, he is really kind and helpful, the place is big, there are enough beds for everyone, all bedrooms have their climate control, kitchen is fully prepared, two bathrooms, excellent facilities, the view from the window is awesome you can see sagrada familia just in front of you, and you'll be staying in Avenida Gaudi that is a significant place, there are a lot of restaurants, stores, super markets walking distance from the apartment, I really enjoyed the time here, there is a metro line Sagrada Familia that is near to the apartment also, It was an enjoyable experience to stay here. 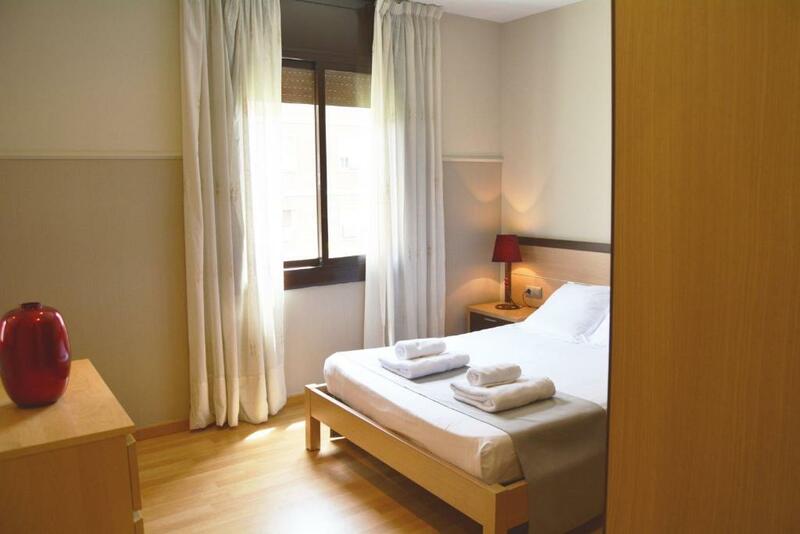 Lock in a great price for Suite Home Sagrada Familia – rated 8.6 by recent guests! 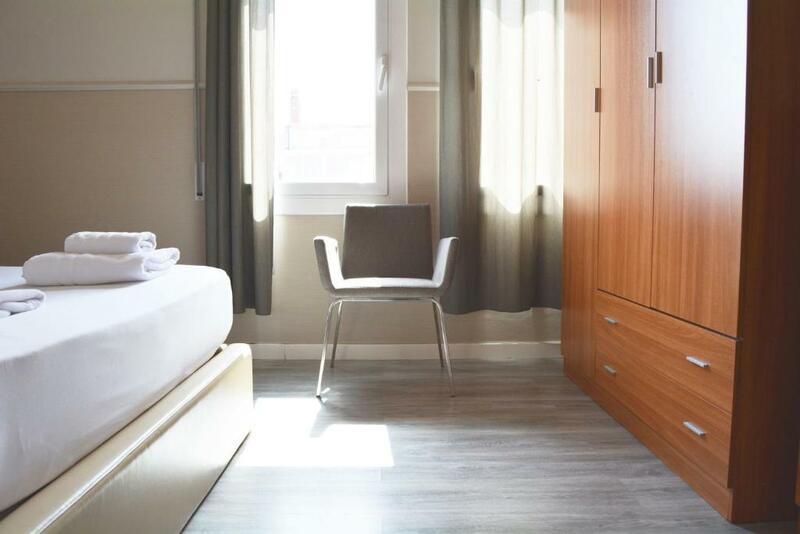 One of our top picks in Barcelona.Located on tree-lined Gaudí Avenue, Suite Home Barcelona is just 800 feet from the Sagrada Família cathedral. Some apartments offer views of Barcelona’s famous monument. All apartments are fully-equipped and air-conditioned. Free Wi-fi is available. The stylish apartments have parquet flooring and contemporary furniture. The spacious living and dining area is equipped with a flat-screen TV, and CD player. A free safe is also provided. The kitchen features an electric hob, oven, dishwasher and microwave. A washing machine and ironing facilities are also included. Suite Home’s luxury apartments are within walking distance of several cafés, restaurants and supermarkets. 뀐 Located in the top-rated area in Barcelona, this property has an excellent location score of 9.4! 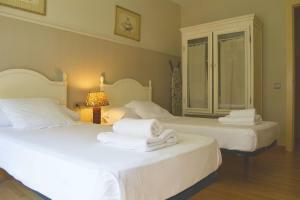 When would you like to stay at Suite Home Sagrada Familia? Offering views of Sagrada Familia, this stylish, air-conditioned apartment features a spacious living-dining area with a sofa bed and a flat-screen TV. The kitchen is completed with an oven, a dishwasher and electric hobs. A washing machine and ironing facilities are also included. There is free WiFi available throughout. This stylish, air-conditioned apartment features a spacious living-dining area with a sofa bed and a flat-screen TV. The kitchen is completed with an oven, a dishwasher and electric hobs. A washing machine and ironing facilities are also included. 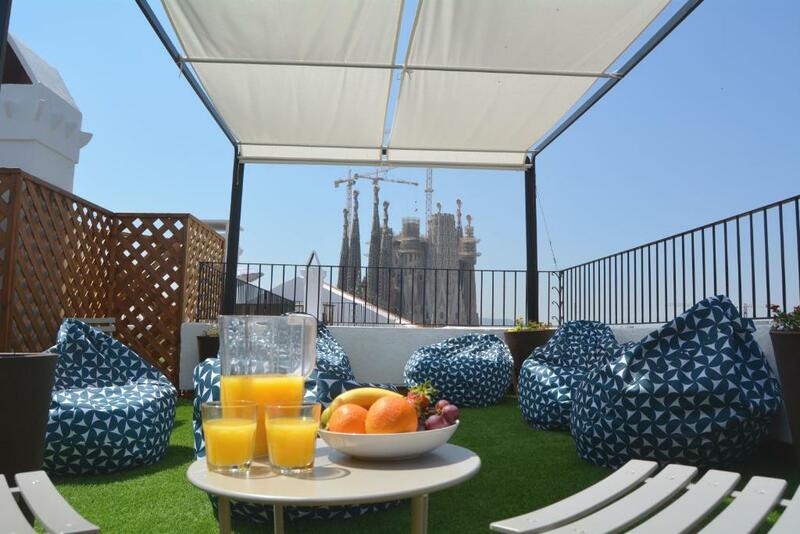 This 4-bedroom apartment comes with a private terrace with views over Sagrada Familia. The spacious living-dining area has a sofa bed and a flat-screen TV; while the kitchen is completed with an oven, a dishwasher and electric hobs. A washing machine and ironing facilities are also included. "Welcome to your home” is our slogan, but we will go beyond that. Our fantastic team will be delighted to make you feel like a local with insider’s tips and doing their best to fulfill your special requests. In Suite Home Sagrada Familia we want you to live a real Barcelona experience; the best way? 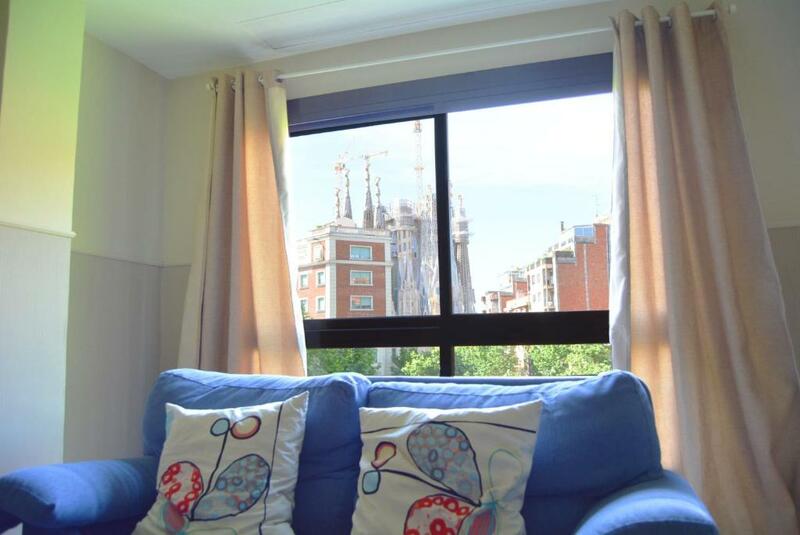 With our "Sagrada Familia Views Apartments" you will wake up with amazing views of the work-in-progress cathedral. Our 100 square meter apartments can accommodate up to 6-8 people. 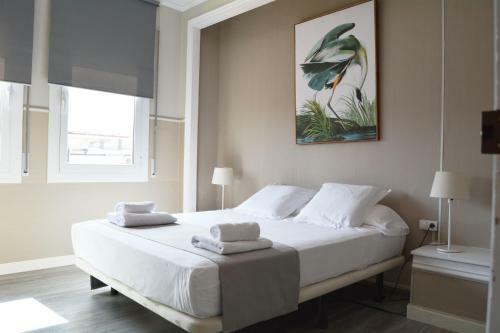 It doesn’t matter if you are a group of friends who wants to meet the city or a family that would love to explore the local culture; Suite Home Sagrada Familia is the place for you. By the way… Here’s a little secret: We also have a rooftop terrace / solarium with the best views in town (And we are not saying that just because it’s ours). House Rules Suite Home Sagrada Familia takes special requests – add in the next step! A EUR220 damage deposit is required on arrival (around USD247.36). This deposit will be fully refunded 7 days after check-out, as long as there isn't any damage to the property. Suite Home Sagrada Familia accepts these cards and reserves the right to temporarily hold an amount prior to arrival. Please note that late check-in after 20:00 carries a EUR 20 surcharge. When booking more than 3 apartments, different policies and additional supplements may apply. Please inform Suite Home Sagrada Familia of your expected arrival time in advance. You can use the Special Requests box when booking, or contact the property directly using the contact details in your confirmation. A damage deposit of EUR 220 is required on arrival. That's about 247.36USD. This will be collected by credit card. You should be reimbursed within 7 days of check-out. Your deposit will be refunded in full by credit card, subject to an inspection of the property. Great team of ppl. Can see Sagrada Familia from the balcony of the property. Coffee Machine wasn’t working and despite a couple of reminders it wasn’t fixed until the night before we left. Location superb. Bed mattresses in all rooms very comfy and property was cleaned during our stay. Plus - roof terrace with view of Sagrada a real bonus. 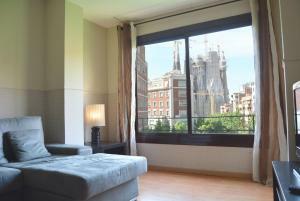 View was amazing, close to Sagrada and metro stations, huge apartment, plenty space, very clean. The roof area is nice. Beds not that comfortable. I little noise at night. Easy check in! Nice neighborhood! The sound-proofing of the rooms are weak. The view from the room and the location are perfect. Good price value. The hot water gets cold soon when we take a shower. The staff said we could only have one person at a time, even if we had two toilets. And the hot water lasts only three to five minutes, after water cooling, we had to wait for 20 minutes. We have five people, it took us more than an hour to waiting after a long tour. we love the roof :) and rooms. :) very nice and friendly girl from reception ...tnx for everything!! Fantastic location and view - from our windows we could see Sagrada. Very nice attic. We had breakfast at this attic. The location and the apartment itself was so spacious, clean, and very comfortable for 5. The front desk was very helpful. The after hours check in was a bit challenging, and the room we stayed in could use updating. The location is ideal and the rooftop terrace is magnificent. We got charged € 20 for late checkin even though we did everything ourselves by using the automatic chrckin machine.